Hello quilters! 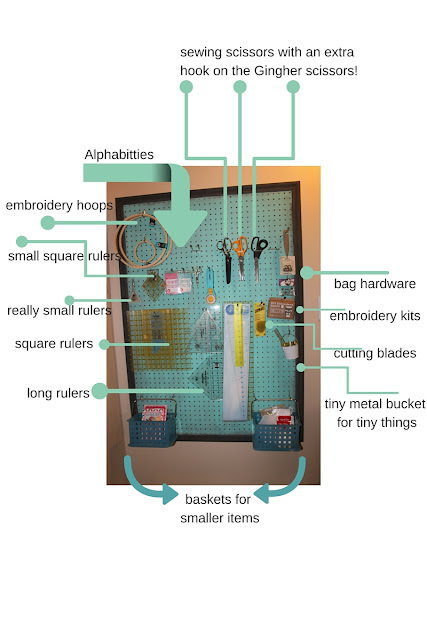 At last I am blogging about my Quilting Tools Peg Board Organizer. I have been waiting for the perfect lighting conditions to take a photo of my peg board organizer but let's face it... my sewing room is in the basement and the lighting conditions will never be perfect. So here we are with a less than perfect info graphic that I have created for you. :) I am not a graphic designer as you can probably tell and this is a bit of a mish mash of free Canva arrows but I hope you get the gist of what I am showing you here. My Dad gave me some old peg boards that he had in storage for years. I chose one of the larger ones and got my husband to square it up for me with his skil saw. I bought panel edge trim at the hardware store (about $40 CDN - it was just over $2.00 a foot) which my husband cut with a mitre box. If you, or your spouse, are lucky enough to own a compound mitre saw that would make the job really easy. If not, you can get a mitre box fairly inexpensively or even easier... get the hardware store to cut them to your measurements (I know they do this at Home Depot.) Just make sure your measurements are very accurate! Maybe take along the peg board just to be on the safe side. Attach your trim pieces to your peg board with a brad nailer. If you do not own one you can rent these types of tools by the hour from places like Home Depot. (Wear safety glasses!) If you are going the rental route try to have several projects lined up ready to nail to make it worthwhile renting the tool. Fill the nail holes with poly fill or paintable caulking. Sand smooth and paint. I painted both my peg board and trim with Country Chic Paint all-in-one decor paint. The peg board was painted with "Tropical Cocktail" and the trim was painted with "Rocky Mountain." This is a clay based self priming paint that dries with a chalky finish. I decided the turquoise (Tropical Cocktail) was a bit too bright after two coats so I went over it with the slate grey (Rocky Mountain) and then wiped it off with a rag to give the peg board more of a grunge look. We attached a 2 x 2 to the wall making sure to drill the screws right into the studs behind the drywall. Make sure to screw the 2 x 2 into the studs as the peg board itself has some weight and then when you add all the pegs and tools it will get really heavy. Drywall on it's own will not be able to hold it! Then we attached the peg board to the 2 x 2 by putting screws through some of the holes at the top and drilling into the 2 x w.
I bought all kinds of peg board hardware at Canadian Tire. I spent about $40 CDN total, including the two plastic "spa baskets" at the bottom of the board, and I have many left to make another peg board. You can also find peg board hardware at places like Walmart and Home Depot. Try to get some variety packs so you have lots of options. I just started putting up pegs and adding my quilting tools to the board until I had all my little bits and pieces organized. I tried to think of it as setting up a display in a shop and I think it did turn out that way. So now I can "shop" my supplies. I have some empty space too so I can add more tools and supplies later. I hope this gives you some ideas for organizing your own tools and supplies. Thanks for visiting my blog today!